In the past two years, few newly launched cars have garnered as much attention as the Hyundai i30 N.
That’s in part because the hot hatchback segment it joined – one where many long-standing models such as the Volkswagen Golf GTI and Honda Civic Type R sit – is so revered and in part because it’s rare that there’s an all-new entrant to it, and a pretty decent one at that. During my six months with the i30 N, it has attracted ample interest: the entire breadth of the Autocar team has hankered for a go and there has been plenty of curiosity elsewhere too. There was the very nice youth in Asda car park asking me about the car and telling me he had one on order, there were the middle-aged engineers circling the car on my return to it in a Northamptonshire office car park and it attracted lots of kerbside glances as well. First, let’s address the elephant in the room: the ride. In its most extreme driving mode, N, the i30 N’s ride was described in its Autocar road test as “too unbearably vicelike to be tolerated for more than 10 seconds or so even on averagely surfaced UK Tarmac”. It concluded that you “quickly learn that the car is at its best before you start dialling up the settings”. That's all true. The ride is the thing that most people talk about when they borrow the car. Going over suburban road bumps that are rife in my area takes some getting used to, even in the softest mode. But most i30 N owners are more than happy, according to Albert Biermann, the man responsible for the car: “The fans love the N mode. They love it as stiff as possible.” Despite the criticism, the more you live with the car, the more the ride becomes perfectly acceptable. Sure, I was reminded of its extremity when I borrowed our Golf GTI long-term test car for a week but I quickly settled back into daily life with the i30 N.
Other features also developed for the track, but ones that translate far better on road, are the precise gearchanges and steering feel. During my six months of having the i30 N, the satisfaction of changing gears, especially lower down the range, and cornering it around lovely country roads has never worn off. The other performance-related trait that stood out is torque delivery. For me, it didn’t have the low-end torque I’d expect of a hot hatch; something the Golf GTI and Peugeot 308 GTi offer aplenty. The torque of both of those is more linear than the i30 N’s. The upside of that is midrev-range acceleration that is more surprising and exciting, making getting up to motorway speeds from a slip road a fun endeavour. The exhaust note is the other area of, um, note. It sounds far more like a hot hatch should than the Golf GTI does. It’s even louder than the Civic Type R, known for being lairy. Living on a quiet suburban street meant I kept the exhaust note to a minimum, but for those boy-racer moments, you can customise settings to make it crackle and pop in N mode. The infotainment system isn’t as glossy as the Golf GTI’s, but it functions well and connecting to and using Bluetooth was far easier than in most cars. Hyundai has stayed on the conservative side with the interior but has rightly spent the development money for its first hot hatch where it should: on an excellent powertrain and track-worthy chassis. The only issue that came up over six months was a fairly regular warning on the dashboard, suggesting the autonomous emergency braking (AEB) system was disabled due to a dirty/impaired camera. It occurred mostly when it was raining but sometimes in fine weather too. It didn’t bother me, but does raise bigger questions over how effective the system would be if it came to a scenario where AEB was needed. For those in the market for a hot hatch, the i30 N’s price is also significant. 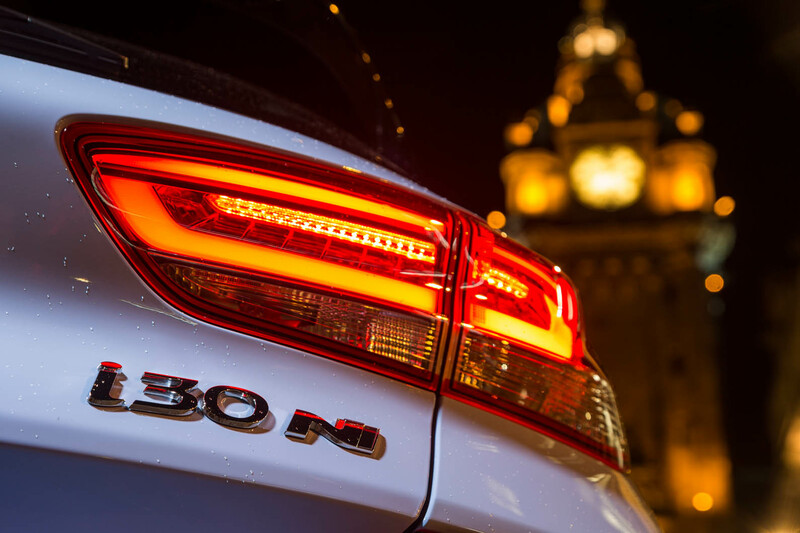 The 248bhp entry-level i30 N costs £25,010, while our i30 N Performance costs £28,010. The cheapest five-door Golf GTI is £30,325 and the cheapest Type R £31,525. The Hyundai is also better equipped so, at the very least, you’re going to save two grand, and possibly much more, by going for an i30 N.
Ultimately, the i30 N is a flawed beast but, in its flaws, you also find its charm. 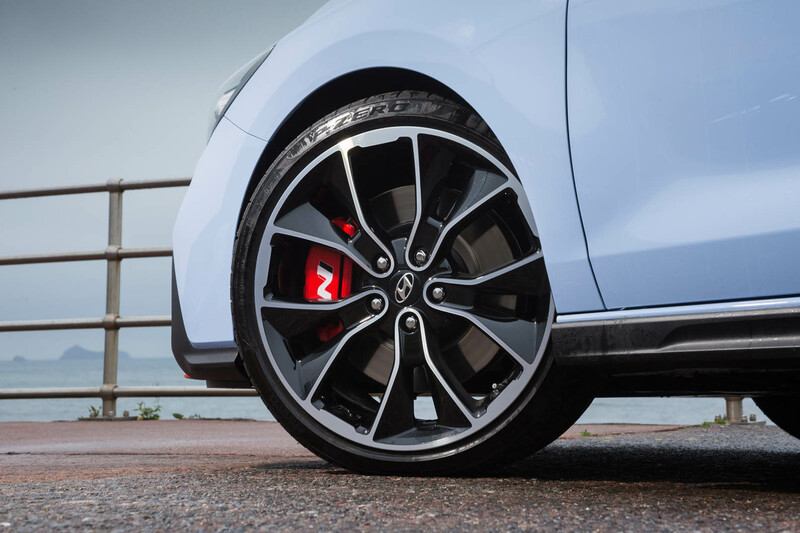 Hyundai has excelled with its first hot hatch, which suggests great things for the facelift and also the broader range of N cars being launched over the next few years. So, the killer question: would I buy it over a Golf GTI? No. But it’s a close call, and many others would. At the very least, the i30 N should be high up on a hot hatch seeker’s shortlist. I’ve never known a hot hatch divide opinion as strongly as the i30 N, thanks in large part to its no-compromise attitude the further up the settings range you go. But at its best, it is brilliant – and for a first effort, and as a car to show Hyundai’s credentials beyond the mainstream of its core products, it is a total triumph. HANDBRAKE Apparently, there was a discussion over whether to fit a traditional or electric one. They chose right. GEARCHANGES Satisfyingly accurate. Designed to excel on track but also rewarding when driving sedately around town. PRACTICALITY This hot hatch fitted perfectly well into my day-to-day life, which sadly doesn’t involve track driving. ALLOY WHEELS Someone, for the love of God, design a good-looking alloy that isn’t scuffed easily. Please. AEB WARNING Overactive warning light that came on, presumably from front sensors/ cameras confused by any weather. It’s not every day you find yourself on Silverstone’s full Formula 1 circuit. It gets even more unusual when Albert Biermann, Hyundai’s R&D boss and former BMW M development chief, is sitting in the driver’s seat. We’re in my i30 N long-term test car, helmets on and disclaimers signing our lives away completed, and are lucky to get the circuit to ourselves for half an hour during a break in the track sessions. Indeed, Biermann tells me that half of i30 N owners it hosted in May at the Nürburgring 24 Hours had never even done a track day before. Biermann announces early on that he hasn’t driven on the Silverstone circuit for more than two decades. I mysteriously developed car sickness four years ago, so his admission isn’t the most reassuring of starts. And so we’re on our way, firstly at slow speeds without our crash helmets to get some of the pictures you see here, and then, once the photographer has wisely jumped out and we’ve put our lids on, the track is entirely ours. “I have no idea where I’m going,” says Biermann, but for someone unfamiliar with Silverstone’s racing lines, he’s doing a good job at judging them and drifting through corners. After a couple of laps, the tyre pressure warning alarm goes off. As we draw into the pits after a cool-down lap, Biermann proclaims that the circuit “doesn’t have enough corners for the i30 N. It’s too boring, too flat and too wide”. So what did I conclude after our three-lap run at Silverstone? Three things. One: Biermann is a highly proficient driver. Two: the i30 N is a highly proficient track car. Three: I felt queasy for a good few hours afterwards. ON-TRACK THRILLS We revelled in the i30 N’s adeptness on a circuit. BACK ON THE ROAD Coming back down to earth on public roads was less enthralling. A two-week staycation gave me the chance to drive quite a few miles in the i30 N. What struck me is that after five months with the car, none of the novelty of driving it has worn off. The precision of the gear changes and steering feel still fill me with glee, it is still as comfortable as ever on long journeys and I’m still as impressed as ever with the Hyundai’s all-round capabilities. Forget Goodwood, Le Mans or Spa – for me, the greatest motorsport event is the Nürburgring 24 Hours. How so? Because nowhere else lets you get so close to such incredible racing. Trust me, once you’ve seen GT3 cars scream past old Calibras in the dead of night at the toughest circuit in the world, everything else seems sterile. Hyundai was competing at this year’s N24 with a pair of i30 N TCR cars, and invited us to bring our longtermer along. Rachel Burgess, our i30 N’s custodian, wasn’t available, but I most definitely was, and along with photographer Dafydd, I set off for a weekend of cars, currywurst and camping. What could be better? There’s nothing like a good European road trip for showing off the best and worst in a car. Sadly for the Hyundai, I found a few niggles. The driving position lacks sufficient adjustment to get comfy if you’re over six foot, the seat not going low enough and the steering wheel not out far enough. There are more supportive seats in rivals too. Plus, should you plug your phone into the USB port to charge, Apple CarPlay automatically starts and plays music you might not be keen to share with your passenger – some Whitney Houston, purely as an example – and the main volume dial is a fair reach across the dashboard. There are wheel-mounted ones, though. That said, there was a lot to enjoy on the trip. The i30 N is certainly rapid: 150mph was achieved on the autobahn very simply and a 120mph cruise maintained comfortably. Perhaps now isn’t the time to mention iffy fuel consumption but, even though we weren’t in three figures much (honest), a 31mpg average seems a bit mean. At the circuit, the i30 was met with a positive reception. Locals were very intrigued by the Hyundai they’d heard so much about, and nothing demonstrates performance car kudos like Nordschleife locals showing interest. They’re a discerning bunch, after all. 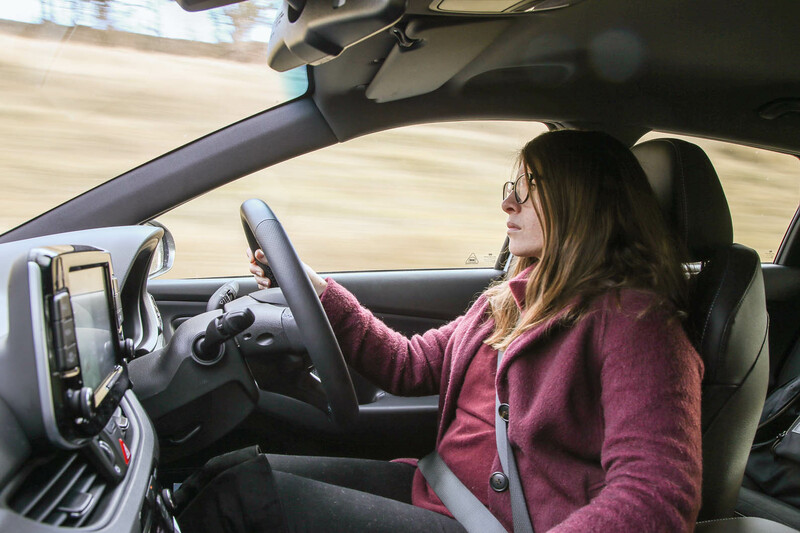 Driving the car on the fantastic roads nearby, the concerns about ergonomics and fuel economy fizzle away when that electronic limited-slip differential is hauling you out of bends and you’re awaiting every last shift light before changing up. Be in no doubt, the Hyundai is a feisty, fun, really focused hot hatch. Sometimes too focused for its own good, though, because N mode makes everything too firm, too heavy and too obstinate. The nearest parallel is in the Sport Plus modes of recent BMW M cars, in fact, so it would seem the one bit of Albert Biermann influence on Hyundai the Korean company could do without. I was recently at Silverstone, where the relatively understated i30 N received plenty of attention, even in the company of some brash racing cars. People were fascinated to find out what it is capable of. We also had another i30 N on static display at the circuit during last month’s Autocar Awards. Even when parked near a Rolls Phantom and Mercedes G-Class, the i30 N drew glances. As someone with minor OCD, there are two quirks on the i30 N I struggle with. When the headlight stalk control is set to ‘auto’, it isn’t quite flush. And the digital and analogue speedometers don’t tally: there’s, give or take, 4mph between them. Small details, though. Overall, the i30 N continues to be a usable, well-rounded and enjoyable car. Before I get into this, I just want to state that I love our Hyundai i30 N. It’s fun, packed with kit, looks great and more in my kind of price range than a few other notable hot hatches. But I’ve been thinking: I wish the Hyundai had the engine from my old Peugeot 308 GTi. I’m not saying the Hyundai’s unit is bad and my criticism almost certainly stems from the fact that most of my weekday driving is at low speeds around town, but the Peugeot’s 1.6-litre turbo was smoother and had more punch low down in the rev range. It’s in that 0-30mph range where I used to have a smile on my face in the 308 GTi, but it’s not quite there in the i30 N. I’m regularly reminded of this on an uninspiring stretch of road in south-west London, where I turn left from a relatively quiet residential street onto a faster three-lane carriageway via an almost-blind bend. Each time I accelerate to join the main road, I really would like more low-end oomph. The i30 N isn’t lacking in power compared to the 308 GTi – in fact, it has 271bhp compared with the French car’s 267bhp, plus a lot more torque – but it weighs almost 200kg more than the French hatch and that could be the determining factor. The good news is that the lethargy all but disappears as you shift up through the gears. Floor the throttle in second gear from 20mph on a dry road and you get launched forward ferociously. On a wet surface, you have to be smoother on the pedal to avoid spinning up the front wheels. There’s also an N Custom mode that allows you to create your own set-up. I’ve got rev-matching on to replicate heel and toe gear changes, the suspension in Normal, and the steering in Sport (I find it too heavy in Sport+, the most extreme mode), but with the engine responsiveness and the exhaust in Sport+. It’s a good set-up for spirited driving, albeit with ride compliancy that seems a more natural fit for Britain’s bumpy roads. The car flows on an A-road better with the softer damping mode, whereas in Sport+ you feel every mid-corner bump. The downside to my set-up is that I’ve made the loudest car on my street even louder. My partner says he can hear me start up the car while he’s sitting in the house no matter how far away it’s parked and setting the active variable exhaust to Sport+ adds to the drama. There’s a throatier growl as you accelerate, with a more attention-grabbing pops and bangs as you shift down through the gears. I suspect another reason why the car is getting more attention is because of growing awareness and media coverage. On a recent drive into central London, there were plenty of passers-by looking at the car and some even taking photographs of it. That’s quite an achievement for a car maker that is trying to raise the emotional appeal of its brand. The i30 N’s subtle yet differentiating looks help, too. Our light blue car (or ‘Clean Slate’ in Hyundai’s palette) is eye-catching in a way that a black body colour perhaps wouldn’t be. 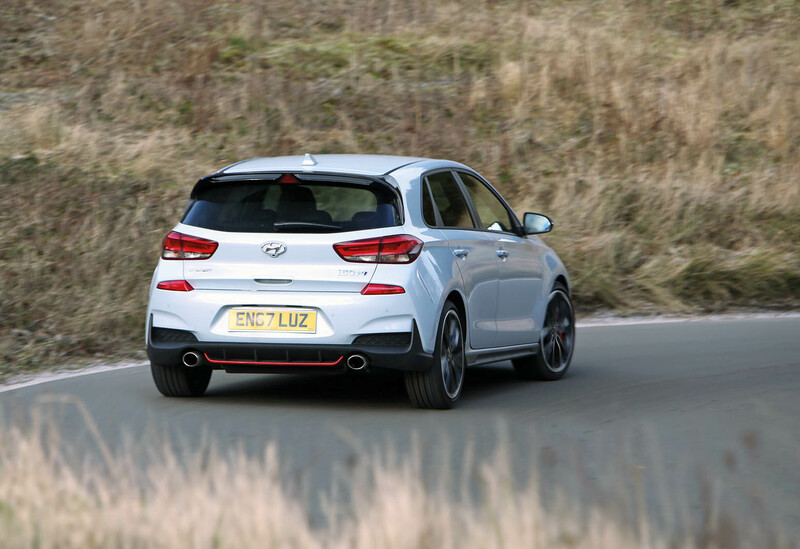 OUTRIGHT PACE Top-end performance is a thrilling testament to what Hyundai has achieved with its first hot hatch. LOW-REV LETHARGY A broader range of torque creating more lower-down-the-gears punch would be a welcome bonus. In my last report, I bemoaned the lack of heated seats in an otherwise very usable day-to-day hot hatch. But I’m told that an optional £300 winter pack has been introduced for the i30 N and includes a heated steering wheel and front seats. If only I’d known before the recent blizzards. That aside, the front-wheel-drive i30 N coped with the snow admirably. On a recent trip to Southwold, I had the choice of two cars: my i30 N long-termer or a Mk6 Volkswagen Golf 2.0-litre TDI. I wanted the Hyundai, keen to stretch the car’s legs on plenty of windy Norfolk and Suffolk roads. But I also had my mum to consider and she favours (sensibly) heated seats and comfort, both of which the Golf could offer. The wonderful daughter that I am, we ended up taking the i30 N.
Having had the car for two months, I’ve enjoyed plenty of trips, but this was the first time I’d racked up a few hundred miles in one go and on a variety of roads, so I was intrigued to see whether it was as comfortable and practical as a standard i30 but perhaps with an added dose of fun – or should that be fuN? And in simple terms, that’s all true. On the first leg of our journey – all motorway and dual-carriageway A-roads – it was firm but pliant enough in standard mode, making it perfectly fine for a few hours on faster roads. It’s also relatively quiet. Another thing I noticed on our long drive was the car’s lane-keeping assist feature steering for me, trying to keep me in the lane. It’s a feature on a number of cars these days, but it wasn’t something I expected in the i30 N, and some cautious testing revealed that it’s quite effective. The system won’t allow you to keep your hands off the steering wheel completely, but it does still provide a welcome break on some long stretches of boring road. Once we arrived at some seemingly never-ending B-roads, the i30 N revealed a little more of its character. The heavy steering came to life, letting me dart into bends with really impressive grip from the front tyres. What I’m enjoying most, though, are the accurate gearchanges, which are a joy, even in sedate, urban situations. On the open road in Suffolk, they were better still. There have also been some interesting reactions on the road to the i30 N. It doesn’t attract the kind of unwanted attention that you might get in, say, a BMW 440i (I know from personal experience) but I’ve seen a handful of people react to it – either intrigued to know what it is or wanting to see how fast it goes. My mum – who, I appreciate, is not the i30 N’s target audience – was surprised to hear it was a rival to the Golf GTI, which demonstrates that it’s quite sensible-looking for a hot hatch. What she obviously missed was the satisfying exhaust note on start-up, which makes me smile and cringe in equal measure when leaving the quiet suburban street where I live. On a recent trip in the i30 N, our snapper Stan Papior, who is running a Honda Civic Type R, remarked how my car’s exhaust note was better than the Type R’s. Hyundai one, Honda nil. Our weekend jaunt to rainy Southwold confirmed my early impressions, then. The i30 N has a dual character that makes it usable yet fun. It sounds boisterous and it can act boisterously if you want it to, but it can be well behaved too. If that all sounds too sensible for Hyundai’s first hot hatch, then rest assured: putting it in N mode really ups the ante. The ride is crazy-hard (perhaps best left to the track, it’s that hard), the steering heavy and the exhaust pops and crackles on the overrun. More on that in a future report once I’ve explored it more. And so there were no regrets about opting for the i30 N. The Golf would have made for a cheaper journey but, in every other way, the i30 N was a brilliant weekend getaway car. GEARCHANGES Incomprehensibly enthused about precise gearchanges, making even short, tedious journeys enjoyable. POSH WHEELS Not a car for tight parallel parking on high-kerbed streets. Alloys are so far unscathed, thankfully. First word of Hyundai’s N performance brand came more than four years ago and, since then, the Korean car maker’s presence in the World Rally Championship has ensured it has gained experience in, and received plaudits for, honing machines far removed from the good if unremarkable family cars for which it is better known. Within a year of stating those performance intentions, Hyundai had appointed Albert Biermann as head of vehicle test and high performance development, with N no doubt dangled as the carrot to lure him away from the world of BMW M engineering. Ever since, Biermann has been busy developing this car, the i30 N – which will eventually be one of a range of N cars – as well as the Stinger GT of Hyundai’s sibling Kia. It’s a bold move by Hyundai to attempt to launch a credible hot hatch in a world full of rivals with heritage: the Volkswagen Golf GTI, Peugeot 308 GTi and Honda Civic Type R are just three on that list. Then late last year, we did a full road test of the i30 N. It received a solid 3.5 stars – respectable but placed behind four other hot hatches in our eyes: the Civic Type R, Seat Leon Cupra 300, Golf GTI and Skoda Octavia vRS. The verdict? “Its biggest failing is that the commitment evident in its mechanical make-up wasn’t quite matched to the expert chassis tuning it deserved.” There was much criticism of the most extreme setting of four (plus a custom one), called N mode, which was deemed near unusable, even on track, because of its rigidity. Now we have the chance to drive an i30 N day in, day out for six months and expose it to the realities of life where track driving is an occasional treat rather than a weekly occurrence, and where the most potential joy will be found on rural driving roads away from base in suburban London. We’ve opted for the more powerful i30 N, the i30 N Performance, because it’s expected to be the bigger seller of the two, which isn’t surprising given it still undercuts all of its rivals, costing from £27,995. It uses a turbocharged 2.0-litre four-cylinder engine producing 271bhp (compared with 246bhp in the lower-powered version) and 260lb ft of torque – although it can reach 279lb ft on overboost between 1500rpm and 4700rpm – all of which is channelled through a six-speed manual transmission. The i30 N Performance also adds an electronic limited-slip differential and a variable-valve exhaust. The car covers 0-62mph in 6.1sec, 0.3sec quicker than the standard i30 N.
Does it have many similarities to a boggo i30? Well, the bodyshell is the same, although the N gets underbody strut braces. There are wider wheel arches and the car sits 8mm lower. Then there are some styling changes – aggressive bumpers, deep intakes, a red pinstripe on the splitter and that gloss black rear spoiler plus some good-looking alloy wheels, in our case 19in with Pirelli P Zero tyres. The only option on our car is the £585 Clean Slate paint colour, which brings the cost to £28,580. So far, it’s not my favourite-looking hot hatch, but it does tread a very respectable line between standing out against its standard i30 sibling (something the 308 GTi has failed at) and standing out too much (something the Civic Type R has failed at). It’s also very well specified. Gear includes wireless phone charging, parking sensors, DAB radio, keyless entry, Apple CarPlay/Android Auto and sat-nav on an 8.0in touchscreen. First impressions? Good and bad. Mostly good. But they can wait until my next report. One thing that has resonated was an unlikely encounter with a stranger as I returned to the i30 N in an Asda car park. Having been approached with an “excuse me” – which, as a true Brit, made me instantly wary – I was asked by this trendy youth if I knew if this was one of the first delivered i30 Ns. You see, he had ordered one, too, and had been told he’d receive it near the end of February. He said he had an i20 Sport and his dealer had suggested he wait for the i30 N rather than go for an i30 Sport. He was incredibly excited, talked about the reviews he’d read (ours, naturally) and asked if he could wait around for me to turn the engine on to hear the blip. I obliged. This conversation impressed on me two things: how wonderful a chance encounter can be when there is a shared enthusiasm; and how brilliant that Hyundai has made a car that excites. Having expected most i30 N buyers to be conquest customers tempted to the brand by its hot hatch capability and affordability, this anecdote shows me there’s also plenty of scope for people already invested in it. Which, all in all, sounds very positive for Hyundai.